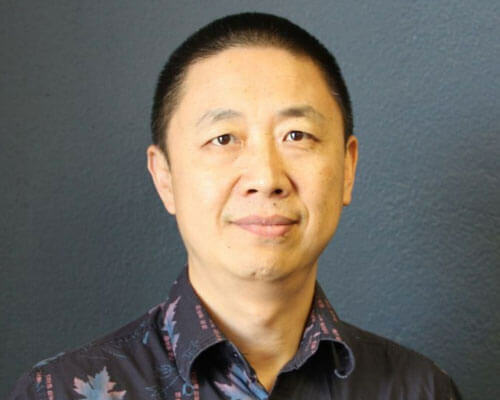 Home » Academics » Schools » School of Science, Engineering and Technology » Faculty » Xinghai Chen, Ph.D.
After earning his doctorate, Chen had 15 years of experience in an oncology-focused pharmaceutical company, BioNumerik Pharmaceuticals. As Group Leader of the Medicinal Chemistry Drug Discovery Team, he successfully advanced two novel drug candidates from concepts to completed phase 3 trials. His research interests focus on the development of new strategies in organic, bioorganic and medicinal chemistry to solve biochemical problems at the interface of chemistry and biology. Particularly, he is interested in optimization of drugs in development, on the market or those that are shelved because of lack of efficacy, to develop their second generation new drugs, which benefit patients through a potential new therapy or a better therapy sooner. This research involves understanding the complex biochemistry involved in drug metabolism and developing innovative chemical solutions to reduce or eliminate the biochemical metabolism to inactive metabolites. Yao S.; Petluru, P. N.; Parker, A. R.; Ding D.; Chen, X.; Kochat H.; Hausheer, F. H.; “An in situ Chromatography Method for Analyzing Camptothecin in Plasma Protein Solution.” In preparation. Hausheer, F. H.; Parker, A. R.; Petluru, P. N.; Jair, K. W.; Chen, S.; Huang, Q.; Chen, X.; Ayala, P. Y.; Shanmugarajah, D.; Kochat, H. “Mechanistic study of BNP7787-mediated cisplatin nephroprotection: modulation of human aminopeptidase” Cancer Chemotherapy and Pharmacology 2011, 67(2), 381-391. Hausheer, F. H.; Ding D.; Shanmugarajah, D.; Leverett, B. D.; Huang, Q.; Chen, X.; Kochat H.; Ayala, P. Y.; Petluru, P. N.; Parker, A. R. “Accumulation of BNP7787 in Human Renal Proximal Tubule Cells”, Journal of Pharmaceutical Sciences, 2011, 100(9), 3977-3984. Hausheer, F. H.; Shanmugarajah, D.; Leverett, B. D.; Chen, X.; Huang, Q.; Kochat H.; Petluru, P. N.; Parker, A. R. “Mechanistic study of BNP7787-mediated cisplatin nephroprotection: modulation of gamma-glutamyl transpeptidase.” Cancer Chemotherapy and Pharmacology 2010, 65(5), 941-951. Shanmugarajah, D.; Ding, D.; Huang, Q.; Chen, X.; Kochat, H.; Petluru, P. N.; Ayala, P. Y.; Parker, A. R.; Hausheer, F. H. “Analysis of BNP7787 thiol-disulfide exchange reactions in phosphate buffer and human plasma using microscale electrochemical high performance liquid chromatography.” Journal of Chromatography, B: Analytical Technologies in the Biomedical and Life Sciences 2009, 877(10), 857-866. Comins, D. L.; Chen, X.; Larry, M., “Enantiopure N-Acyldihydropyridones as Synthetic Intermediates: Asymmetric Synthesis of (-)-Septicine and (-)-Tylophorine”, Journal Organic Chemistry, 1997, 62, 7435. Comins, D. L.; LaMunyon, D. H.; Chen, X., “Enantiopure N-Acyldihydropyridones as Synthetic Intermediates: Asymmetric Synthesis of Indolizidine Alkaloids (-)-205A, (-)-207A and (-)-235B”, Journal Organic Chemistry. 1997, 62, 8182. Comins, D. L.; Joseph, S. P.; Hong, H.; Al-awar, R. S.; Forti, C. J.; Zhang, Y.; Chen, X. LaMunyon, D. H.; Guerra-Weltzien, M., “Asymmetric Synthesis and Synthetic Utility of 2,3-dihydro-4-pyridones”, Pure & Applied Chemistry 1997, 69, 477. Comins, D. L.; Chen, X.; Joseph, S. P., “Synthesis of 2, 4-Disubstituted N-Acyl-5, 6-dihydro-2-pyridones”, Tetrahedron Letters 1996, 37, 9275. Comins, D. L.; Joseph, S. P.; Chen, X., “Regiospecific Substitution of N-Acyl-2, 3-dihydro-4-pyridones at C-5 via Halogenation and Cross-coupling”, Tetrahedron Letters, 1995, 36, 9141. Narkunan, Kesavaram; Kochat, Harry; Chen, Xinghai. “Process for preparing highly lipophilic camptothecin derivatives”. US 6723849. Huang, Jerry; Kochat, Harry; Chen, Xinghai; “Medicinal disulfide salts”. PCT Int. Appl. (2006), WO 2006/034327.